I could eat soup for about 9 months out of the year… In fact, I usually make soup about once a week from September thru April! It’s warm and comforting, easy to throw together for one pot meals, and usually yields lots of leftovers. I also love that soups are easy on the wallet, it seems the grocery bill keeps climbing every time we hit the grocery store! We had an amazing year with the garden and yielded 6 butternut squash! For our tiny little suburban garden, I think that’s pretty darn good. Last year we only had 2! Butternut squash has become my favorite squash next to spaghetti squash. Roasted and tossed with olive oil and a little salt n pepper, it’s a comforting Fall squash that tastes buttery and creamy. I also like to add it to soups and chili, it brings in another level of flavor to those one pot dishes! 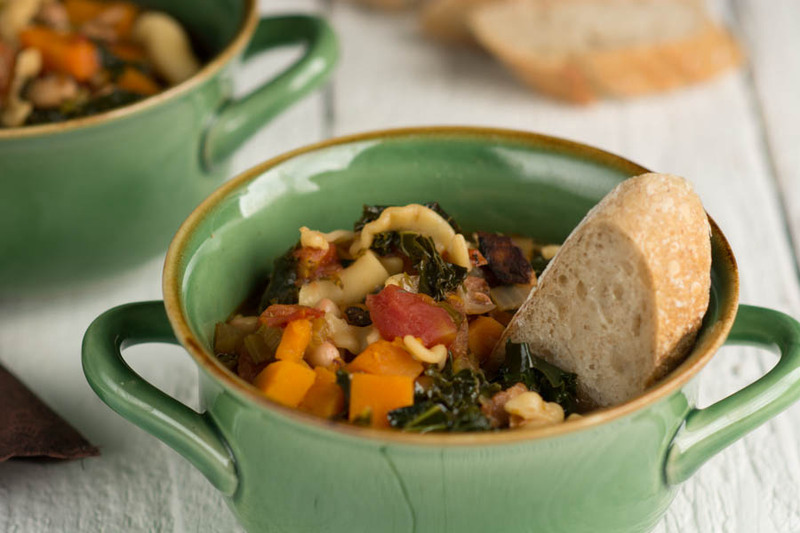 My version of Minestrone soup is similar to the classic but with more vegetables. 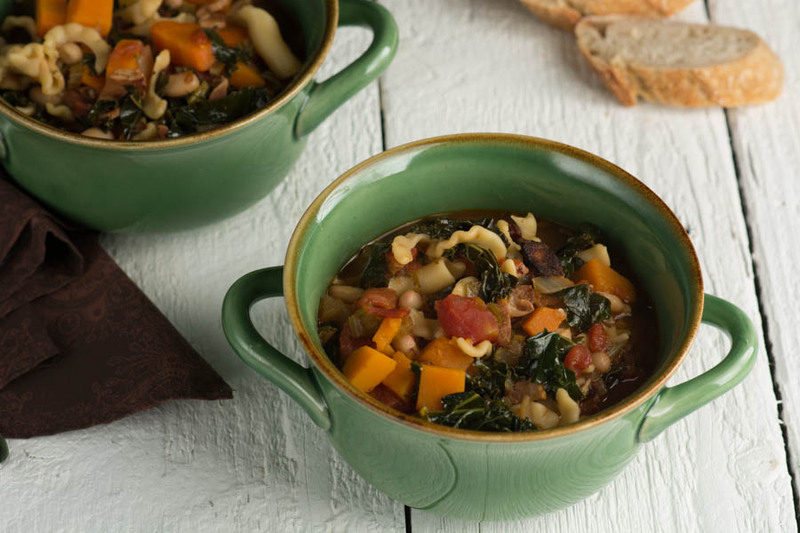 Kale and butternut squash are added to this soup to make it more filling. And if you are one of those cooks that have homemade chicken stock in your freezer, then get that stock out for this soup! I also opted to use larger noodles in my soup instead of the teeny tiny tubetti pasta. Pasta that is so tiny that you can barely taste? No thanks- use your favorite larger noodle to add texture and heartiness. Oh and did I mention there is bacon in this soup too!!! I keep waiting for Fall to arrive this year. It has been a weird, warm Fall in Oregon with temps in the mid 70s in October!! We even went to the pumpkin patch and it was almost 80 degrees that day? So not Oregon weather! But that has not stopped me from making soup. Maybe November will yield a cooler month? We’re hoping for snow this year so we can enjoy some snow shoeing on the mountain. 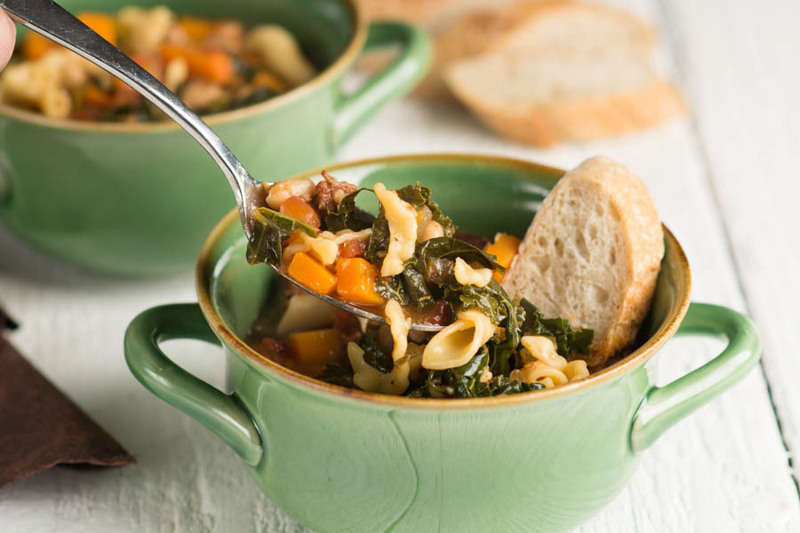 This soup would be perfect to come home to after a day of playing in the snow! Fingers crossed! In a large dutch oven or pot, cook bacon. Next add all the vegetables with some olive oil, except the kale. Cook until tender. Add the herbs, salt and pepper, canned tomatoes, and chicken stock. Bring to a simmer and cook for 30 minutes. In the last 5 minutes, add the Kale and rinsed beans. Next add the cooked pasta. This LOOK delish and healthy too. Soup is definitely a great option, especially as the weather gets cooler.